Are you an eHealth SME? Apply here! The eHealth Competition is an initiative that rewards the best eHealth/mHealth solutions produced by European SMEs. This 2015’s edition is organized by T ICBioMed and it has the endorsement of the Health and Wellbeing Unit of the European Commission. This Competition r ecognizes the best eHealth SMEs at European level and support their business success by giving them visibility together with marketing opportunities to attract customers, partners and external capital. 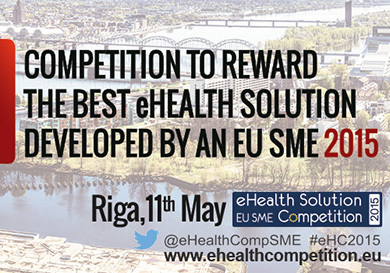 The eHealth Competition Final this year will take place on the 1 1t h of May 2015 in Riga (Latvia), as a satellite event of the e Health Week conference, one of the most important eHealth events in Europe.